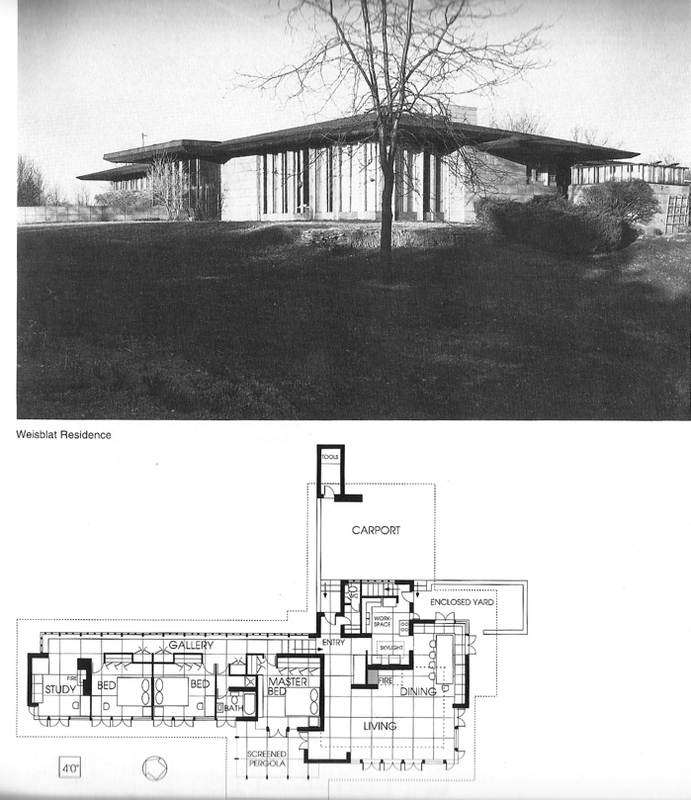 Of all the FLW houses accused of being too dark, Weisblatt is the one that most fits the bill. The interior has a lot of concrete and dark wood, with few reflective surfaces. As I recall, the Howe addition was suitably subdued, adding on to the bedroom wing. (Though it has been a long time since I saw it!) The screened porch is one of the nicest touches. The framing, as I recall, was painted Cherokee red. Overall a very livable house. Mrs. Weisblatt was still in residence at the time. Two references refer to the roof of this house as "cantilevered" -- in one case, "from side wall masonry." Mysterious. . . I haven't found interior photos. The plan shows a corner-opening pair of doors -- but the photos don't bear that out. . .do they ? There would have to be stiles at the corner, not mitered glass. . . I have been in this house and I agree with Roderick that this house is dark, but upon examining the the orientation of the two walls of glass in the living room that face south I can only conclude that vegetation to the south is blocking the light. It appears the Wright did what he usually did, place the window-wall to the south. 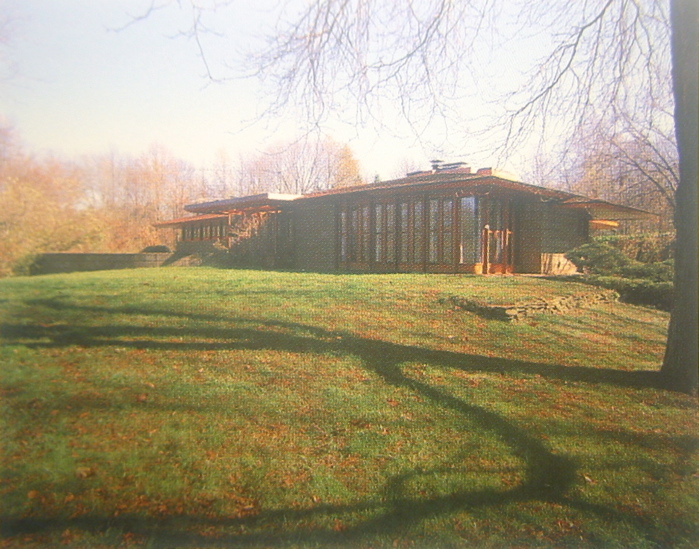 From historical photos it appears that most of these Usonian homes were built on naked farmland and the trees were subsequently not Wright's fault. "...it could be considered a township site, and as such the choice of random coursed limestone masonry walls is totally inappropriate. " Can there not be stone quarries in Townships? vocabulary have different meanings there. In any event, several posts on pages one and two express differing opinions on the matter . . .
have served as antidotes to the notion. One thinks of Richardson's courageous/outrageous Marshall Field Wholesale Store in downtown Chicago, of 1885-7. I suspect Laurie's comments about the appropriateness of rough stone in the city or townships would not extend to the work of HHRichardson at Marshall Fields in Chicago or for that matter, the Allegheny Courthouse and Jail in Pittsburgh as those granite stones (blocks, really) were carefully dressed at their edges to make precise, formal joints between blocks, lintels, and segments of Roman arches. The comment relative to the Smith house focused on the difficulty inherent in making such an imprecise material as fieldstone or quarried ledgestone conform to such an exacting organizational module as a diamond or triangle. Brick would seem a more logical choice. Brick vs. Stone: Every brick building sits upon the earth. Many stone buildings emerge out of the earth, unless the stone is dressed.
. . . and yet, Wright has his brick penetrate the earth in many structures, once he has left the water table behind ? 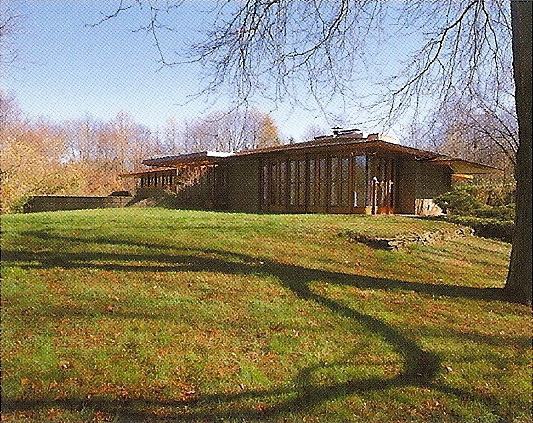 The Kraus house comes to mind; parts of the house are bedded in bordered crushed rock while others rise directly from the grass. With or without the water table, brick is a manufactured material, not a natural one. It sits upon the ground. You might find FLW houses with brick flooring in front of the fireplace, but never brick growing out of the earth like the FW fireplace. It would look contrived. There are places in FLW's work where stone seems to grow out of the ground and find its way into the interior. Even the brick terrace at Willey doesn't do that; it reaches out from the brick structure into the environment, but does not rise out of the earth. At T-West, the concrete is so much like the desert floor, that the building seems to emerge out of the desert. Stones lie strewn about the desert, and the stones in the concrete are an abstraction of that natural environment. with which man chooses to protect his structure, from the waste and ruin nature stands ready to inflict ? walls rising from the surrounding lawns without an intermediary -- water table, edge of slab, or other. Brick is clearly distinguished from nature, while stone (undressed) is an extension of nature. Daniel, I agree with you 100%: The Smith House is excellent.